Today I’m teaming up with BHLDN to share with you a holiday look I styled from their incredible selection of event dresses. We would love to see your holiday look too! Pin your complete holiday look for a chance to win a $300 BHLDN gift card. All details and entry submission here. Also, be sure to check out the Haute Holiday pinterest board where you can be inspired by all things, feminine, shimmering and holiday! Gorgeous winter white look! 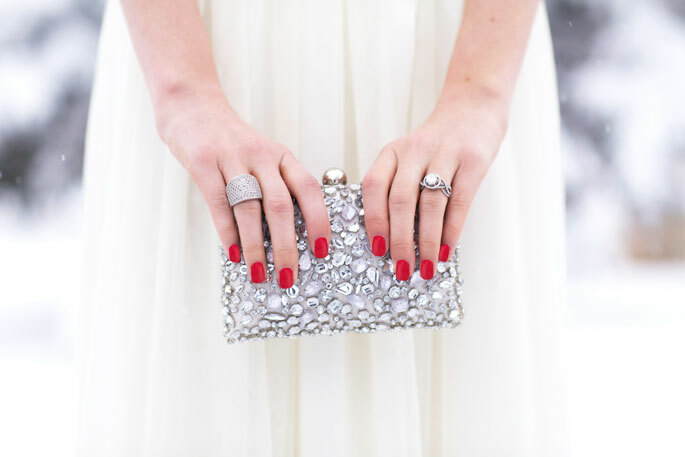 That dress, topper, and clutch are to die for! You look stunning! Beautiful!! That dress is so elegant and chic and you wear it really well. Wow this dress is stunning. You look so gorgeos. Love the pictures. I think it was very cold durig your photoshooting. Ahh! I love this look. It’s so gorgeous, especially with the wintery background. White is perfect for winter! I just love these pictures too! I love the red lips and nails, they complete the look. Quite stunning. Thanks for showing us winter white! And that faux bob! Again! White is such a flattering color for your complexion. I must admire the dress from afar because I am far too pale to pull off that color. So beautiful Rachel! Absolutely love this. Especially the fur shrug. I’ve been looking for one like this for ages! Rach, this is literally my favorite post ever! Love, love, love. This is such an amazing look! You look gorgeous!!! Wow, this is breathtaking! You look gorgeous! Oh my! This is the most beautiful dress and you look absolutely stunning Rachel. These pictures are absolutely gorgeous!!! The backdrop, the snow, the dress, the red lips, the woman!! AH can’t get enough Rachel, just stunning! SO gorgeous! Congrats on your new site! absolutely stunning!! love that red lip color! You look like a bride in these pictures, absolutely stunning. Wow you look so gorgeous!!! That dress is so pretty on you and I love your hair like that!! Oh my gosh…this is breathtaking!!! The outfit, the setting….everything is so magical! I love it! OH MY GOSH! Soooooooooooooooooooooooooooo pretty! You must have been freezing! Beautiful- you look like Snow White! Wowsa! Gorgeous photos Rach, they seriously belong in a spread of a bridal magazine! The hair, makeup, and accessories are all perfection! Wow! You look absolutely stunning in this dress! Perfect inspiration for wearing winter white. WOW!!!!! Snowy white looks stunning on you! Wow, these pictures are incredible! What a gorgeous dress and a gorgeous setting! You look great, Rachel! I am loving your hair lately! So vintage and classy. Tutorial soon? Love this look!! Obsessed! Definitely a tutorial is coming soon! Stay tuned! This is stunning! You always look amazing. Stunning. You look like an ice queen. What an amazing dress and AMAZING pictures!!! Winter Wonderland!! So stunning!!! You look like a snow queen. Gorgeous! The link for the ring takes you to a M.A.C nail laquer. Would love to purchase, Ariella is fabulous. Wow! Talk about a winter wonderland! You look stunning! Absolutely stunning. You look like a princess in a winter wonderland!!! The dress is incredible with the fur shrug. The clutch is so gorgeous. Again, it is so lovely to see more posts without your sunglasses. You have great skill with makeup colours and such a naturally beautiful palette to begin with! I love the new website! Looks fabulous! This looks like it should be in a magazine, beautiful! Merry Christmas! Thanks Caroline, hope you and little baby Knox are well! Gorgeous!!!! Love the new look! These photos are beautiful! I love the all white with your bold lip. I’m assuming that’s a faux bob? It’s gorgeous – I’d love to see a tutorial on how you get it pinned up! This is such a stunning holiday look! Absolutely love this whole look! the snow is gorgeous! OMG you look absolutely beautiful! What a gorgeous dress! Love the shoulder caps! So dreamy! How glam is this! Seriously this is so pretty… it’d be a great look for a winter bride! I love that minaudiere! I can’t even begin to say how gorgeous you look in this! You look absolutely beautiful. I hope you get to wear this actual outfit to a party! This is absolutely gorgeous!! Jaw-dropping. you look absolutely beautiful in these pictures! such a Winter Wonderland! This is gorgeous! What brand/color is your blush?!? Wow!!!!! That is an AMAZING outfit. I want, I want!!! You’re gorgeous! Like a princess! I most certainly will instantly clutch system your current feed while i will not obtain your current e-mail request web page link and also e-newsletter company. Do you have virtually any? You need to let me comprehend so that I might sign up. Thank you. This dress is amazing!! You look stunning in it!